A pot pie is baked savoury dish encased in a flaky pastry and baked in a pie tin to ensure it maintains its shape. There are several varieties including an Australian meat pie and various British regional types. In America, the pot pie can be filled with various types of meat including beef, chicken, or turkey as well as vegetables such as carrots, potatoes, and green peas. 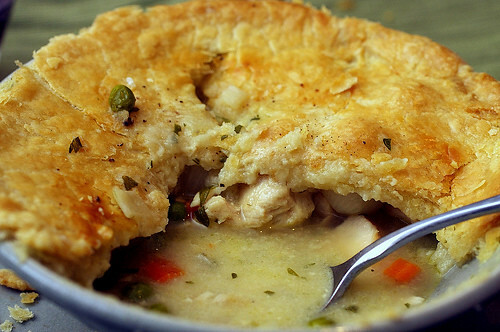 The chicken pot pie may be the most popular and is simple to make. The ingredients are 1 poundskinless, boneless chicken breast, cubed, 1 cupsliced carrots, 1 cupgreen peas,1/2 cupsliced celery,1/3 cupbutter,1/3 cuponion chopped, 1/3 cupall-purpose flour,1/2 teaspoonsalt,1/4 teaspoonblack pepper,1 3/4 cupschicken broth, and 2/3 cupmilk. First preheat an oven to 425 degrees F. Then in a saucepan combine the carrots, chicken, peas, and celery, add water and cook for 15 minute then drain. In a separate pan over a medium flame cook onions and butter add flour, salt, and pepper. Slowly add the broth and milk and cook until thick. Put the mixture in a pie crust then cover with the liquid, add the top pie crust and make a few slits in the top. Bake for between 30 and 35 minutes or until pastry is golden brown.